The Constitution is not so simple that it explains itself—nor so complex that only experts can understand it. In this accessible, nonpartisan quick reference, historian Andrew Arnold provides concise explanations of the Constitution's meaning and history, offering little-known facts and anecdotes about every article and all twenty-seven amendments. This handy guide won’t tell you what the Constitution ought to say, nor what it ought to mean. It will tell you what the Constitution says and what it has meant. 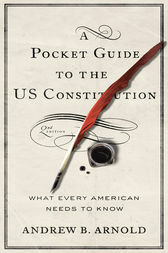 A Pocket Guide to the US Constitution presents a straightforward way to understand the American Constitutional system. Without wading through lengthy legal prose, heavy historical analysis, or polemical diatribes, you can easily find out what the emoluments clause means, learn about gerrymandering and separation of powers, or read a brief background on why slaves in colonial America were considered 3/5 of a person. Small enough to put in your pocket, backpack, or briefcase, A Pocket Guide to the US Constitution can be used to comprehend current events, dig deeper into court cases, or sort out your own opinions on constitutional issues. Andrew B. Arnold is chair of the history department, Kutztown University. He received his PhD from the University of North Carolina-Chapel Hill.